As we close out a year of headline-grabbing data breaches (British Airways, Under Armor, Panera Bread), the introduction of GDPR and the emergence of new application development architectures and frameworks, Radware examined the state of application security in its latest report. This global survey among executives and IT professionals has yielded insights about threats, concerns and application security strategies. As it turned out there are quite a few threats to application services that are not properly addressed as traditional security approaches are challenged and stretched. In parallel, the adoption of emerging frameworks and architectures, which rely on numerous integrations with multiple services, adds more complexity and increases the attack surface. 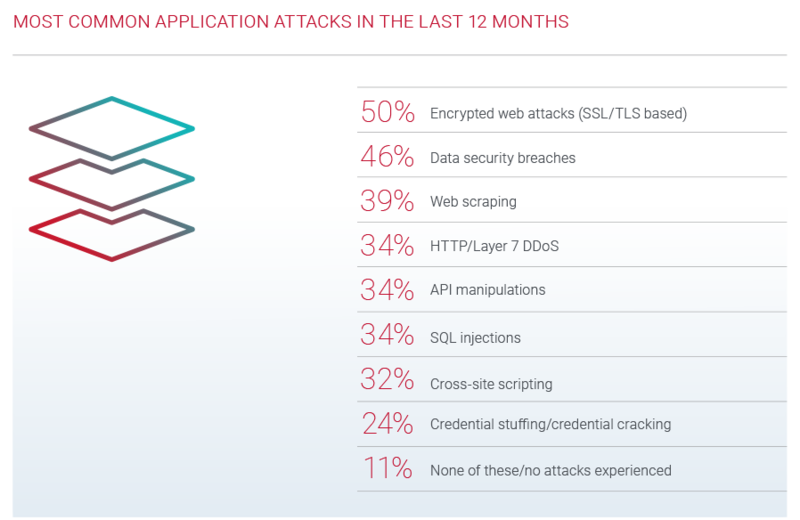 63% suffered denial of service attack against their application. DoS attacks render applications inoperable by exhausting the application resources. Buffer overflow and HTTP floods were the most common types of DoS attacks, and this form of attack is more common in APAC. 36% find HTTP/Layer-7 DDoS as the most difficult attack to mitigate. Half of the organizations take rate-based approaches (such as limiting the number of request from a certain source or simply buying a rate-based DDoS protection solution) which are ineffective once the threshold is exceeded and real users can’t connect. Negative consequences such as loss of reputation, customer compensation, legal action (more common in EMEA), churn (more common in APAC), stock price drops (more common in America) and executives who lose their jobs are quick to follow a successful attack, while the process of repairing the damage and rebuild of a company’s reputation is long and not always successful. About half admitted having encountered such consequences. Is there a notion that organizations are confident? Yes. Is that a false sense of security? Yes. Attacks are constantly evolving and security measures are not foolproof. Having application security tools and processes in place may provoke a sense of being in control but are likely to be breached or bypassed sooner or later. Another question we are left with is whether senior management is fully aware of the day to day incidents. Rightfully so, they look to their internal teams tasked with application security to manage the issue, but there seems to be a mismatch between their perceptions of the effectiveness of their organizations’ application security strategies and the actual exposure to risk.